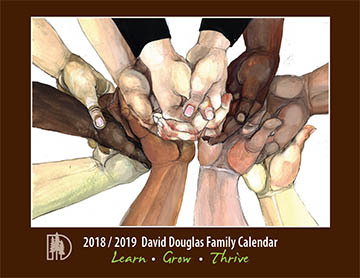 The 2018-2019 David Douglas Family Calendar is here! • When school conferences are scheduled? • When are “No school” days scheduled? • When is Winter Break? • How about the last day of school? Check the David Douglas Family Calendar! A calendar will be sent home for each elementary age family in September. In addition, each school office will have a small supply of calendars. This year’s calendar cover features artwork from David Douglas High School Senior Ester Petukhova. During her Junior year, she was awarded a National Gold Medal Scholastic Art and Writing Award for her art work. We are pleased to have her permission to display her art on this year’s calendar! Be sure to look at your family’s calendar when it arrives home. This year’s calendar theme is diversity in our district. David Douglas Educational Foundation extends its thanks the School District Graphic Artist and other staff members who helped produce this calendar. In addition, we thank the generous anonymous donor who has funded the school calendar since the 2012-13 school year.